Nigerians have taken to social media, to criticize the Oba of Lagos, HRH Rilwan Akiolu, for ignoring the Ooni of Ife, Oba Adeyeye Ogunwusi, at a public gathering. 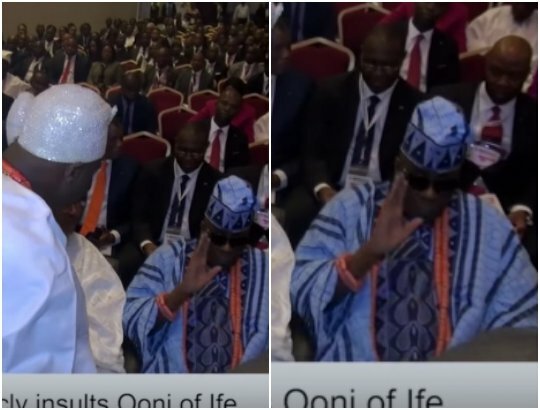 There was an immediate buzz as the Ooni walked into the venue, with one of his aides rushing to wipe his chair clean, but the Oba of Lagos sat uninterested and looked away. The Ooni shook hands with another monarch and he made to exchange pleasantries with the Oba Akiolu, who only raised his hand indifferently.The clip has gone viral, with Nigerians not happy with the Lagos monarch’s reaction, with some describing it as “a public disgrace” and “pure disrespect”. Watch the Video clip on the next page. This entry was posted in Video on April 26, 2017 by admin.